1. In comparison with the 1:72 version of the Extratech Djinn featured in HKN #111, the 1:48 version is pretty much the same in all regards. I can now add that the mystery brass part #24 rolls up into a circular collar which fits between the engine and the intake cowling. I am in the final stages of building the 1:72 kit, and I can say that the engineering is top class. Everything fits pretty well exactly as intended, and even the 3-piece vac-form canopy turned out to be much easier to cut out and construct than I had anticipated. Anyone wanting to buy this kit in either scale should take advantage of another special offer for HKN readers from Matlan, who will send these kits free of shipping charges in the EEC and at a much reduced shipping charge outwith the EEC. Since Matlan's prices for Extratech kits are already the lowest you will find quoted anywhere, this is an offer you CANNOT refuse. 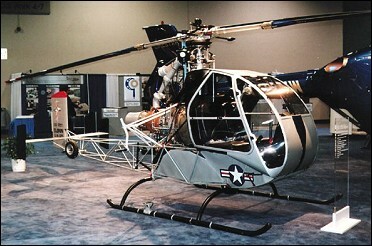 I believe the Djinn shown here may be in the American Helicopter Museum at West Chester, Pennsylvania. Are there any HKN readers out there who would like to send me more pictures of this example? 2. The LF Models Kellet YO-60 (HKN #108) comes in an all colour box and comprises 34 resin parts, 5 in white metal, and a small etched brass sheet with 17 parts. Each of the resin parts is individually wrapped and quite nicely moulded - the resin engine in particular is very nice. The brass sheet includes instruments with card backing and some nice seat belts. The most fiddly bit looks to be the two piece vac-formed canopy which is split diagonally along its centre. A small decal sheet with 14 decals and basic though adequate instructions completes the kit. 3. Sky-High have released a 1:72 Apache, I expect this will be a copy of the Italeri kit and probably won't be available outside Russia. 4. An un-named company in Moscow are planning to launch a new Mil Mi-1 in 1:72 in a month or two. This will not be a copy of the MPM or recent A-Model kits, they have made their own moulds, decals, and box. 5. The Aztec website has been updated with pictures of all the options on their Blackhawk & MD500/530 sheets (HKN #108). 6.. It's a fairly open secret that a delegation from Airfix visited RNAS Yeovilton recently to collect material for an upgrade to their venerable Sea Lynx. 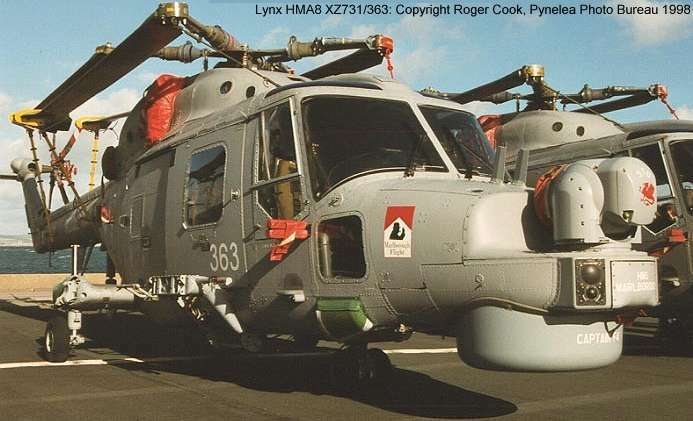 Further enquiries suggest that they are planning a Mk.8 / Super Lynx with Sea Owl nose, Orange Crop, new wheel sponsons, fairings, rotors, aerials, etc. Decal options have yet to be decided but may include UK, Germany, Portugal, and Brazil. These appear to be the same item numbers that Maintrack used for their 1987 resin & white metal kits of the same subjects, so I'm not sure what we're actually going to end up with here. 8. 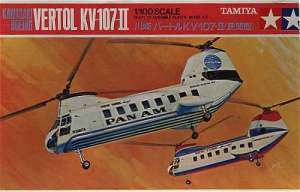 Revell's re-issue of the 1:48 Monogram Hind, now numbered #4462, came out at the end of October. 9. There are some new walkarounds at the Aircraft Resource Center; an H-34, an Ecureuil, and a Hungarian Mi-8. The Mi-2URN & URP-G set consists of 14 resin parts plus 157 etched brass parts and instrument panel film. You can see pictures of the parts at Jadar. InTECH's own catalogue (HKN #94) indicated that they were planning a 'Hekla'. Whether this AirMo set is related to that release I couldn't say. 12. Classic Plane Modelbaustudio Rheim-Ruhr have re-boxed the 1:72 Airfix KV-107 plastic with PanAm & New York Airways decals, and a resin plug for the APU, #CPM20. This is available from Luchtvaart. These are the same options as were offered by Tamiya in their old 1:100 kit of the KV-107-II. Presumably these are also plastic from another company re-boxed by Classic Plane with new decals (and possibly extra parts)? I also note that Luchtvaart have recently taken delivery the Miku Squirrels and Cheyenne, if you are still looking for these. Thanks to Pete Tasker, Petr Zaoral, Yevgeny Borissov, Math at Matlan, and Erwin Stam at Luchtvaart.